Binsar. Away from the fatigue of rush hours and confines of daily deliverables, there’s a jungle out there, green and thriving, full of silent stories that are reviving. There are mountains out there, both mighty and meek. Of so strong a mystique that will leave you tongue-tied. Situated about 30 km from Almora on the Jhandi Dhar hills, Binsar Wildlife Sanctuary is the perfect anti-hill station experience you could ask for. It’s dense, scenic, quiet, well-known yet unexplored and gives you, if not the best then definitely among the best views of the Greater Himalaya. On a very clear day, right from Kedarnath Peak in Garhwal to Panchachuli in Kumaon and a few lesser-known peaks of western Nepal. All this, evoking an unparalleled feeling that they are just an arm’s reach away. Inside the sanctuary, on the way to KMVN TRH. Driving through a forest of deodar, chir pine and oak with the light of the newly-awoken sun barely able to penetrate its thick cover, as the long winding road got narrower and narrower at every turn, it wasn’t all that hard to believe that we’d just taken a big un-leap into an era of minimum intervention. Something that was confirmed in a few minutes after we crossed paths with a deer; it had probably come out for an early-morning breakfast and upon spotting us humans ran uphill for its secret hiding place. With that short-lived rendezvous in mind, we continued driving through the fallen pine cones, needles and dried leaves that carpeted the road, hoping to bump into some more wildlings. Humans were few and far between. What happened next is a scene etched deep in my memory and will ever be so lucid as the years pass by. A not-too-close-yet-personal, first encounter with The Greater Himalaya in about 20 years – a glimpse of Mount Trisul (7,120 m) through whatever little empty frames the standing-hand-in-hand trees gave away. A sheer sight of visceral and cerebral grandeur that surpassed anything I’d ever seen. And if this feels like toying with the boundaries of exaggeration, it’s only because up until this moment I’d been wandering about aimlessly in the foothills (mostly) with little knowledge of or love for some of the highest peaks in India. I’ve been chasing The Greater Himalaya ever since, trying to get as close to them as possible. But that’s a story for another time. A sneak peak in reverse. Doesn’t it look like Trisul is looking at us? The last kilometre or so, tarmac turned to soil and it got a little difficult to steer through casually, before we reached, so to speak, our destination – Kumaon Mandal Vikas Nigam, Tourist Rest House, popularly known by its abbreviated form, KMVN TRH. While I wouldn’t argue that there are much better properties (about 5 and all privately owned) inside the Binsar Wildlife Sanctuary, KMVN TRH takes the cake, and most of the tourists, for securing the best vantage point. Located at the ridge on top of the mountain—thriving forest on one side and a giant valley on the other—and overlooking a 300 kilometre wide Greater Himalayan range one cannot help but give a silent nod of appreciation to whoever from the government was in charge of handpicking these coordinates to set up the property. After a hearty buffet breakfast and dumping our luggage in the room, we tried to sleep it off. My kind of selfie. The selfie with the Himalaya minus the Self. Shot from KMVN Terrace. But such is the lure of the wilderness that doesn’t let you stay put for too long an interval. A newly-bought pair of trekking shoes (Quechua – Forclaz 500 to be precise) were put on and out we went deep into the heart of it all, hoping to catch a glimpse of a few four-legged residents. However, we didn’t encounter anything but an infrequent rustle that made us feel like we’re being watched rather than the other way around, a few beautiful frequent flyers (Binsar is home to about 200 species of birds) who seemed to be having a rollicking good time in the woods, and all the silence in the world broken only by the crunch of the leaves beneath our feet and the wind. When walking is a sheer delight! Inside the sanctuary. Taking a few breathers more than what was necessary and soaking in all that nature had to offer, we made our way to the Zero Point. It is nothing more than what you pass on your way to KMVN except, maybe, more of the forest and a medieval watch-tower like structure that you climb to get an uncompromising view of the snow giants. While the board at the KMVN premises said it was a 2 kilometre walk away, it felt shorter somehow. After spending a good amount of time to our heart’s content, we came back, doing more of the same. The next two days, and parts of extremely cold winter nights, were spent putting our feet up, looking at the Himalaya as they changed colour and offered a different hue every passing minute, chasing sunrises and sunsets, driving to less-populated parts of Almora just for the fun of it, but most importantly, photographing these gargantuan figures of rock and ice. I’ll leave you to it! One look and I understood what ‘Love at First Sight’ actually feels like. 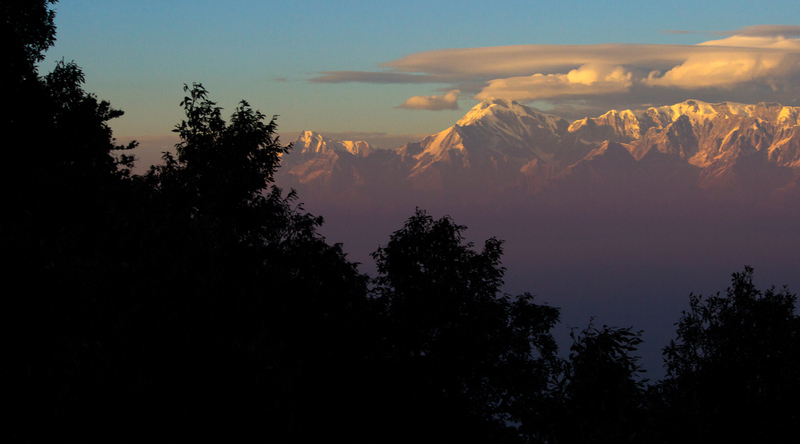 Nanda Devi, Panwali Dwar, Nanda Devi East and Nanda Khat (Left to right). Nanda Ghunti – the friendly neighbourhood mountain, no less in stature or grandeur, to the much loved and revered Trisul. The Mighty Five – Panchachuli. The group’s name is derived from the legendary Pandavas’s “Five Chulis” (cooking hearths), where they cooked their last meal before proceeding toward their heavenly abode. How it must be to live alongside the giants. Trisul, Mrigthuni and Maiktoli (Left to right). Shot from Kasar Devi Village, Almora. The sharp-edged Panwali Dwar. And cloud soaked sisters: Nanda Devi and Nanda Devi East. Trisul set alight by the colours of the setting sun. No less glory to the clouds who decided to indulge in a little play of their own. Changuch (Left) and Nanda Kot (Right). Mrigthuni indulging in a little cloudplay of her own. A walk through the jungle and sunset. As evening came to a close! When the sky is set alight, the fire burns within. Himalaya After Dark – Under the moonlit sky! Love it Mohit! Amazing Pictures and very nicely written. Keep it going! !